GAMES is a partnership with the University of Colorado Natural History Museum developed to encourage interest and excitement about science in 4th and 5th grade girls attending high needs schools in the BVSD. GAMES will provide these female students with an opportunity to visit and interact in a museum and laboratory setting. 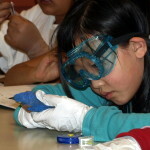 The goals of the GAMES program are to provide 4th and 5th grade female students an opportunity to visit and interact in a museum and laboratory setting, perceive themselves as scientists by providing female professionals as role models and encou rage science education and career paths as part of their future. 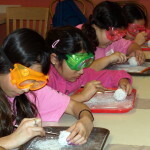 The program consists of seven weekly after-school sessions at the CU Museum whereby the girls explore different areas of science such as botany, entomology, paleontology, archaeology, and zoology through hands-on activities and direct interaction with female scientists and museum professionals. The final session involves student-led demonstrations and a tour of the museum and laboratories for their families. In addition to the sessions, the GAMES Program provides transportation to and from school, snacks, follow-up activit ies, and tool kits for the girls. The program is geared toward low-income students and students of color who are typically underrepresented in scientific careers and the museum-going public. 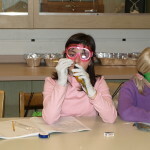 The GAMES program builds confidence, shows the girls that there is a place for them in the sciences, and encourages them to continue their education.